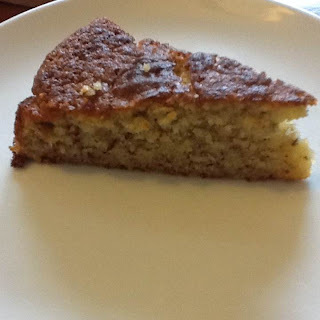 The Queen of Puddings: Banana and ginger cake - low fat cake! Low fat cake seems an oxymoron. But here we have it. A soft, moist cake where the banana and buttermilk mean a reduction of 50% of the butter and 25% of the sugar. Great for breakfast, brunch or afternoon tea. Keeps well for a week. Combine the dry ingredients. Beat in butter and half of the buttermilk using an elecctric hand mixer until well combined. Then add remaining ingredients, beat until combined. Do not over mix. Pour into a greased, lined 9 inch round tin. Bake at 170C (160C fan) for 30-40 mins. Test with a skewer. Serve as is. 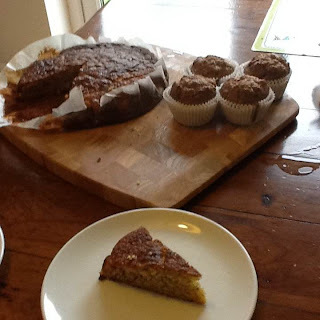 You could make a drizzle icing of icing sugar mixed with a little of the ginger syrup to add to the ginger content.